My heartfelt thanks to all of you who were so kind to leave a comment in last post. I tried all options, except the one with little rings of 4-4, and I had a first sample cup that broken in the middle (I won't show you that) but another two that I like. 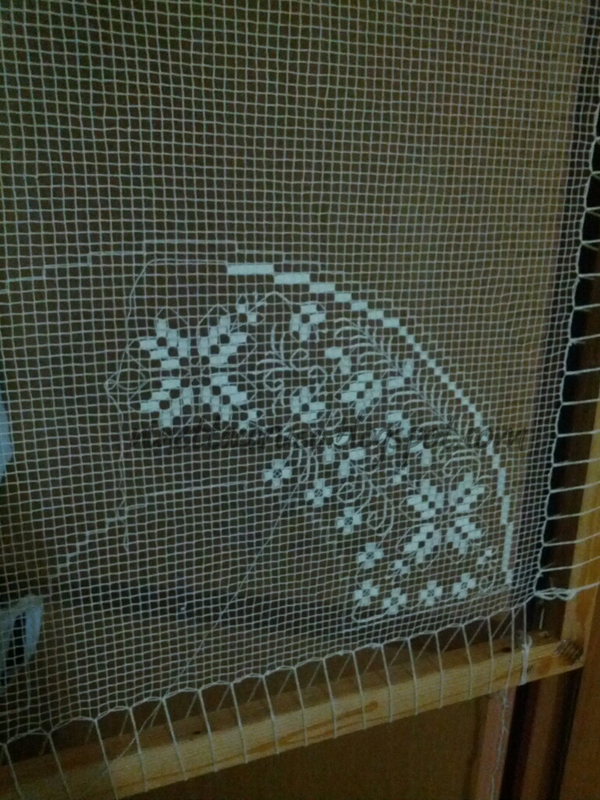 Surprisingly, those two motifs - tatted with the same stitches' count - are (again) very different from each other. (that one in the right is the same showed in previous post). My favourite is the one on the left, tatted with a gauge of 0.5cm both for picots and BTS. 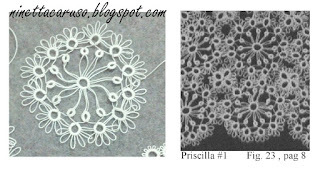 But I think that the one in the centre looks more like the motif in Priscilla's edging. For that one I used a gauge of 1cm for long picots in the centre, then 0.5cm for picots in large rings. For the BTS I left about 2.5mm (more or less, without a gauge). 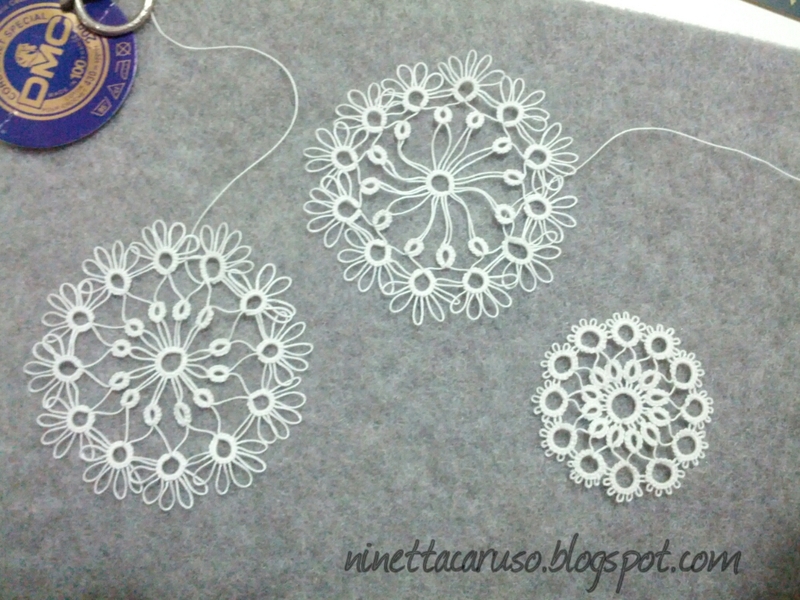 I still don't know which version I'll use for tatting my edging, but now I've a lot of spare wheels to play with! 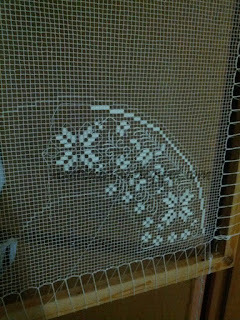 In the meanwhile... Last Saturday and Sunday we met again those Maestre of Bosa's lace, “SU LÀURU 'OSINCU”, we had 2 intense days of lessons and I started embroidering another net. We were few people, less than in past two years, but we enjoyed every minute. They came for the first time in October 2014 , then in October 2015. Really interesting how different the wheels look with different spacing. So you can choose which look to go for. 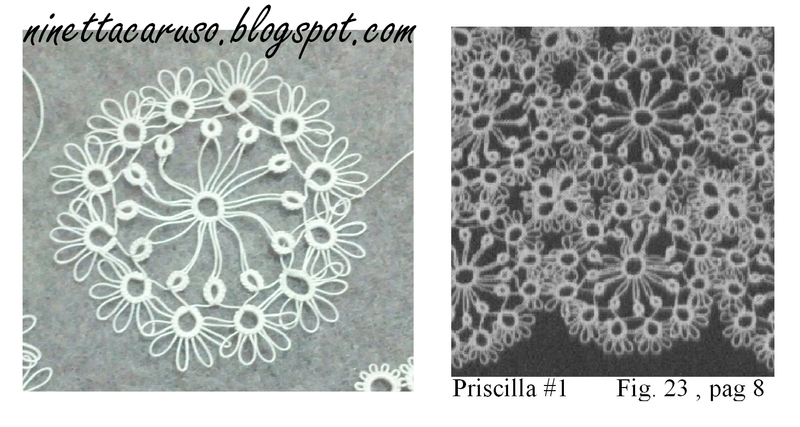 Thanks for the links, I had a look, beautiful lace! 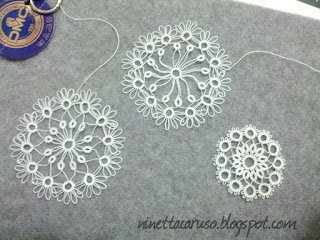 I wonder if you could combine a net and tatting? Your wheels all look very pretty. I agree - the center one looks the most like the original picture, but they are all pretty. It always surprises me how picot length and bare thread space length in some of those 'vintage' patterns makes such a gigantic difference in the finished wheel or motif. They are all so different, and all lovely. I agree the Center one does look like the original, they all look wonderful and could be used in some way.